A Science Test: Finding out what has been learned. Ever since the idea of formative assessment was expressed by Dylan Wiliam and Paul Black in ‘Inside the Black Box’, one of the practical strategies suggested has been the formative use of summative tests. Typically tests are regarded as something given at the end of a unit of work; often they mark the end point of a learning sequence and provide information about how much each student has learned – or not learned. Left as a summative process, the students’ test marks merely become a record of their success at a point in time – without directly helping them improve. And obviously some students will actually know more than their test performance indicates. However, used formatively, tests provide an important source of detailed, individualised feedback identifying where each student needs to deepen their understanding and improve their recall of the knowledge they’ve covered. For me, the immediacy and dialogic nature of classroom question-and-answer has greatest effect; this dominates. When I set homework – as I do religiously – the main feedback mode is to go over the questions in class. Students compare notes and identify areas of common concern; we focus there. But after that, the most useful element is definitely a formative test. If this is about 4/5 of the way through the topic it has most impact. Routine book marking fills in the gaps, dealing with a range of micro-skills and work-management issues; however, it’s not always the place to tackle actual conceptual understanding of science. I find class discussion and tests much more useful for that. The books are a record of sorts in their own right but I try to make students see their books as being for them rather than for me. Also, in evaluating the work, there is always the issue of being blinded or distracted by presentation issues. Tidy work can mask deeper issues. Messy work can be a red herring. In my experience, whilst marking has real value, it is the test that you can’t do without. Logging test scores in a central departmental database is usually the only record I keep. As a ‘comments only’ devotee, I haven’t had a mark book for years. I have no use for it. The key to making tests working formatively is to build in time to give feedback after tests have been done and to make sure students act on it. It doesn’t even matter if you’ve started another topic.. because as David Didau and others have discussed elsewhere, interleaving – or returning to ideas after a gap – actually helps with memory and recall. Why do I think tests are so valuable? I find that tests are the best way to reveal what each student can really do – without learning aids and without asking a friend. In regular classwork and book work, students have the capacity to mask their real understanding and they often do, deliberately or inadvertently; I find this quite a serious issue. Learning in a class has a healthy and helpful social aspect as ideas are explored but ultimately this can mask the progress of individuals. In a test, you are on your own. There is also the effect that students often commit themselves in a test situation.. they want it to count, so they work harder during the test itself than they might if the same questions were just done as a class exercise. That’s not a universal truth, but generally, it’s what I find. Most specifically, a test can tell you how well a student can express an idea in writing – especially if they have plenty of time; time pressure does skew the quality towards the end of a test. Students who appear to have understood a concept in class through discussion sometimes reveal that the depth of their understanding wasn’t quite what you thought or that they don’t have confidence with the vocabulary. Of course, some students express themselves better orally – so testing isn’t the only way to expose learning – but it is rare to be able to hear every student explain something in a lesson. Testing is the only practical way to get to know what every student understands, independent of anyone else. The use of ‘reflect’ instead of ‘transmit’ is revealed. I thought this student knew this. The formative process should involve students getting their tests back and making appropriate corrections. With that in mind, you can give clues, make annotations with suggestions but you can give students some thinking to do. If an answer scores 1 mark out of 2..what else was needed? The follow-up process should ensure the student works this out and improves their understanding. In a typical science unit, there are a range of specific knowledge elements and skills that you will cover. There isn’t quite the same scope for re-drafting and crafting as you have in English, History or MFL, where one big question can we worked on in ever greater depth; in science there are often lots of bits that need to be taught and then somehow brought together. Where marking books is really good for focusing on one specific task or a set of exploratory questions that students have all done, tests are much more useful for covering a range of facts, concepts and problem solving skills that span the whole topic. With a well designed test, I find it much easier to get a sense of that overview of learning. For some reason, I find that exam-style questions from any level of learning are often the most well-designed compared to text books and other resources. Exam boards spend a lot of time and money designing questions and they usually require students to apply standard concepts to new situations. The use of structured questions with associated mark schemes is very helpful. For example, giving marks out of 2 or 4 or 6 is a helpful way to explore the issue of depth in giving scientific answers. Happily, using various software packages, it is helpful to be able to generate mark schemes to match the tests – which saves time and helps students when using self or peer assessment. Knowledge and understanding tested in different ways. A returned test script is arguably more useful to a student than a marked book. If students have time and space to engage with the answers, errors and omissions, they have a good indicator of where they have really understood things and where they haven’t. It’s hard to give this much precise feedback when book marking. Also, the test performance factor comes into play. Students can often kid themselves that they’ve understood in class or when they’ve had the internet or text-book at hand to help them; the test can show them more clearly how successfully they apply their learning. I’ve seen massive divergences amongst students that are only revealed by a test. Two students who express ideas with similar fluency in class and produce similar book work in their own time can perform very differently in a test. For sure some students are good at tests – they have better powers of recall – but usually this divergence is about core understanding and the test is what reveals it; to me and to them. 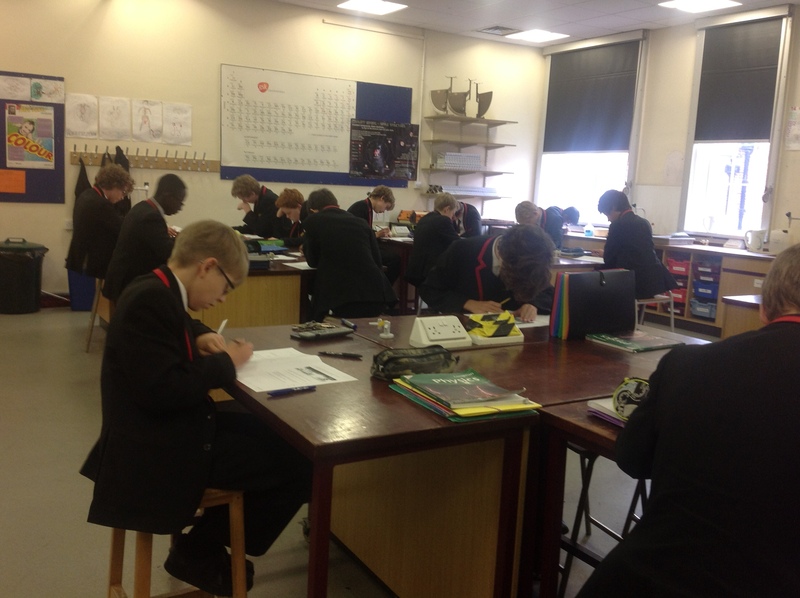 In Physics at KEGS we have introduced a re-test strategy. Students who under-perform on a test, get full feedback and re-take the same test a couple of weeks later. The idea is to ensure we don’t let conceptual misunderstandings slip through; they need to learn how to produce model answers based on the initial feedback. A well structured test with associated mark scheme is a gift for peer assessment. It is much easier for students to mark another student’s test than it is for them to peer assess a flow of book work. I’ve tried this lots of times in my co-construction explorations. Students peer assess well if they are focusing on one specific piece of work only, with clear criteria, or if they are marking a test. The value in doing this is huge. In seeing how another student has answered with reference to a mark scheme – or me giving out the answers verbally – the marker can evaluate their own understanding. It’s very useful formative feedback for them too. Importantly, peer assessment can by-pass the teacher. That’s a mistake. You need to take more interest than just knowing the score. I normally ask students to swap papers to mark them for a quick result. However, I collect in the papers to explore the details and to generate my own feedback. 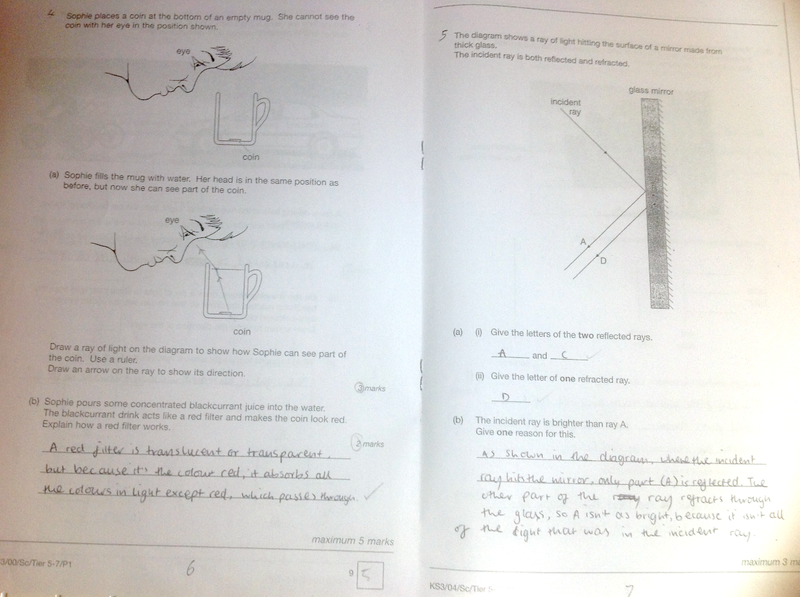 For A level, I usually mark them all myself – because the final answers are only half of the story. For any test, I need to know what the common misconceptions are and to identify where students have gone wrong if they’ve done particularly badly. I’m also always interested to know what the best students get wrong. This always annoys my son. If he gets 32 out of 35, as he did recently on a maths test – I want to know where the three marks went! The formative use of summative tests is a great strategy. However, you need to be sure that the formative process is given time. The test is not the end point; it is a key progress indicator on the way. Focusing on marking tests in conjunction with whole-class classroom feedback processes is a strong structure within which book marking can be kept in perspective. It works for me! I am a GCSE and A level maths teacher and every test I use, I create a question analysis sheet for students to check the skills from the test. During the feedback lesson, they teach each other, in an Ask the expert session, with students getting full marks teaching others who got no marks. I also use the orange box method of highlighting errors that have been made, so they can look for the error themselves. This can be an excellent way of getting specific feedback to different students, then if there is one specific topic that needs revising, I can return to it, to ensure students have learnt skills. Very interesting, Tom. Have a read of Doug Lemov and Paul Bambrick-Santoyo on the benefits of data-driven instruction. I’ve also found that formative use of summative tests seems to be an effective way of working. 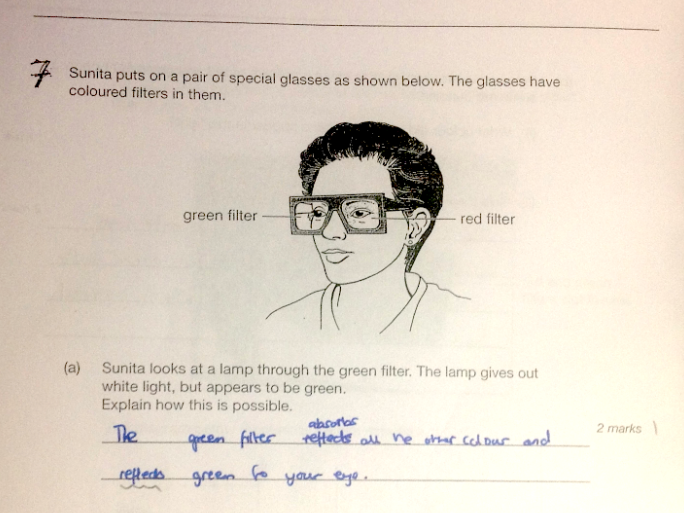 In the run up to KS2 SATs, I’ve given pairs of children old reading and maths papers to do together after modelling various subject specific and test technique strategies. The information gained from them is, like you say, incredibly valuable, perhaps more so than day to day work. Working on more than one concept at a time, coupled with the spacing while scripts are marked is a good combination. Low stakes testing where children practise recalling information and applying it is a great way to develop long term memory. It’s always hard to attribute cause to effect in classrooms, but it’s certainly something worth pursuing further. Thanks for posting. Thanks for that. That outcome is so interesting isn’t it.. including that you learn related content more deeply even it isn’t directly tested.